Is there REALLY an actual diet that supports Astral Projection? 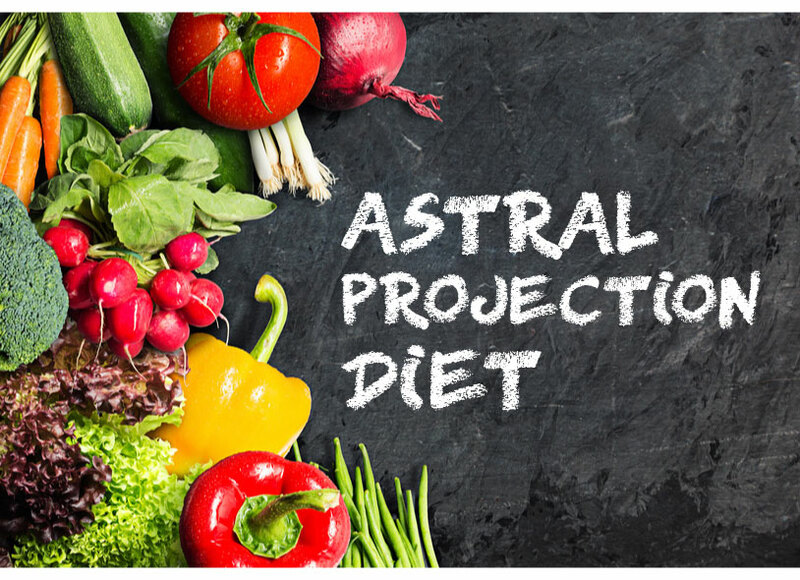 Have you been looking to find the perfect Astral Projection diet? Maybe you’ve read somewhere about what you should be eating, and what you should be avoiding. Maybe you’ve been looking at AP forums, and found lots of conflicting advice. If so, you’re definitely NOT alone – this is one the most common questions I get asked. Like a lot of what is said about Astral Projection, it does get difficult to sort the fact from the fiction. I’m going to be busting a few myths here – so please try not to get offended. The thing is, most of what I consider a good diet for Astral Projection is more-or-less the same as what is a good diet for “normal life”. The problem is, in the modern age, almost no-one eats a good diet for normal life. If your health is suffering, because of the food you’re supposedly consuming to fuel your mind and body, it doesn’t just affect your athleticism and mental prowess. Older civilizations than ours have found it much easier to induce an Out-of-Body Experience – and a lot of this is due to the chemicals and toxins we eat, drink, breathe, absorb through our skin. Astral Projection…deep, peaceful meditation…these are aspects of life that we’ve always been able to enjoy – until relatively recently. But they are our birthright! We’ve got more control over our health than we give ourselves credit for – and I certainly don’t see any reason to get too caught-up in complaining about the food industry, Big Pharma, etc etc etc. As far as I’m concerned, that’s just an unnecessary distraction. Time-and-time-again, I’ve read that a vegetarian, or vegan, diet is necessary. Sorry, but this is simply not true. I do believe that excessive intake of protein is not going to help you – I wrote about that here. Meat takes quite a while for your body to digest, and if you have a meat-heavy diet, then it stands to reason that your body is going to have to work quite hard to process your intake. That’s energy that you’re diverting from projection. But you don’t need to be vegetarian. If you look at the different older cultures that have documented Astral Projection, you’ll see that their typical diets were all very different. Different to ours, obviously, but also very different to each others. Consider the Inuit people – some among them have traditionally practiced Astral Projection, along with other “shamanistic” practices, yet there would be no way that they could have been living as vegetarians, or even having a diet that would have featured much fruit and veg at all! Following on from above, if ancient Egyptians, Inuits, Jewish mystics, Indian yogis, Aztec shamans, Celtic druids, Chinese Taoist alchemists, and the medicine men or yaskomo from the Amazonian Wai Wai people – if these people have all had a fascination with astral travel – how could there be an “Astral Projection Diet”, as such? From completely different climates, and with parts of the world with completely different flora and fauna. This is because human beings are omnivores. We’ve evolved to be incredibly adaptable, which is why we’ve been able to colonize even the most challenging environments, from the Arctic, tropical rain forests, and through to deserts. Wherever we’ve colonized, there’s always been a spiritual aspect to our existence – yet our diet has varied massively – at least up until recently. However, what is the case is that, wherever they were from, our ancestors would have all eaten what I would term real food. Hopefully you know what I mean by real food, but to be on the safe side, I’m going to clarify. If it’s got more that five ingredients, there’s a good chance it isn’t real food. If it’s even got an ingredient list, there’s a high chance it’s not real food. If you look at it, and compare the finished product with the ingredients, and see absolutely no resemblance at all, it’s often not real food. If you went back in time, and showed it to your great grandmother when she was young, and she didn’t know what it was, and was disturbed by it – probably not real food. This was the first diet I tried, and I definitely did find this helped. I first learned of it from a very old text I bought from a second-hand bookshop. The diet was introduced in 1797 by German doctor Christoph Wilhelm Hufeland, but in its modern form, is heavily influenced by Oriental philosophy. It’s based on the belief that illness can largely be prevented by pursuing a proper diet and lifestyle. The idea is that the food you eat, and its quality, have a powerful effect on your health, well-being and happiness. I believe that that for me, the main success of this diet was that it got me to think about the food I was putting inside myself, and how it would effect my body. Certainly, no processed food appears in this diet. Also, this is a low protein diet, in common with what many writers about Astral Projection have recommended. Grains and vegetables feature heavily, white carbs are avoided, and fermented soybeans the main source of protein, although fish is permitted in moderation. Though I did get my first successes at the same time as following this dietary regime, I started to get disappointed with the way it exclusively focused on Japanese foods. Still, I can’t deny that this diet helped me to take my first, unsteady steps towards Astral Projection. If you want to find out more about it let me know, and I’ll provide a link. I also tried this diet, although combining with lots of vegetables. and b) out of curiosity. You see, you can often find mention on forums, as well as many older writings on AP, that both fat and protein should be minimized or completely eliminated. I was curious whether this was true. Which isn’t surprising since this is the kind of diet-balance that Inuit people would traditionally have had. The earlier macrobiotic diet stood me in good stead for this. I tried it simply because I’d read so many accounts of it helping. In fact, if you believe everything you read, you may even start to think it’s essential. In my case, it neither helped nor hindered Astral Projection. Although I didn’t have any unwanted health problems, I didn’t continue this for very long, since a) it didn’t benefit me, and b) I was concerned that it wasn’t a healthy diet for me in the long-term. Like the vegan diet, a raw food diet is often touted as the “correct” diet for Astral Projection. I can understand why – a raw food diet is going to be low in protein, and as I’ve mentioned, too much protein before an attempt at projection isn’t helpful. It’s also likely to be high in healthy fats, while being low in unhealthy fats. So it’s easy to see why it’s often suggested as the “correct” diet. Fact of the matter is, if you’re eating for health and vitality, you’re also on the right kind of diet for Astral Projection. It’s impossible for any food or diet to be good for your body, but harmful for the mind. Just as it’s it’s impossible for any food to be beneficial to your spiritual development without also being good for the body. Instead, focus on your body, and what it is telling you. Once you start to really focus on the value of good food to your mind, body and spirit, you will start to crave foods that are good, and right for you. Vegetables. 5 portions of vegetables a day is a minimum to be functioning at full capacity, and that includes Astral Projection. Focus particularly on leafy greens and cruciferous vegetables, like chard, savoy cabbage, kale, spinach, bok choy, broccoli, turnip and beetroot greens…particularly if you’ve chosen to follow a vegan diet – you’ll need the iron. …and legumes like chick peas, lentils (of any type), fava beans (broad beans), soybeans, peanuts. Legumes are a good, easily digestible source of protein, provide dietary fiber, carbs, and also decent amounts of micronutrients such as magnesium, that, honestly, most people are deficient in. Sprouts from beans and seeds are wonderful and nutritious, and are cheap. Better still you can grow them at home for virtually no cost and very little effort, guaranteeing that you can have a permanent, year-round supply of fresh goodness. Water. Proper hydration is so important in so many ways, and yet so few people actually make the effort to fulfill this basic need. A pint of cold water first thing upon waking is something I swear by. I have a glass ready by my bed, with the juice of one lemon (the only fruit I consume daily, as it doesn’t cause sugar spikes, and is so high in natural vitamin C) and some kosher salt (to replace electrolytes) mixed in. This is also the last thing I drink before I go to bed. I’m serious about this – proper hydration helps prevent weight-gain, eliminates headaches, flushes out toxins, and helps your brain to function as it should. If, where you live, the tap water has added fluoride, you should consider getting a high-quality water filter, or only use mineral water. I explain why here. If there is only one thing that you try out of everything I’m running through on this post – make it hydration. Fish, Eggs and Dairy, White Meats, and Red Meats – in that order. I don’t believe there is any reason to avoid meat, unless you want to, and in that case you do need to take extra-special care with how you’ll be replacing the nutrients contained in meat. Certainly, anything that is tougher for your body to digest will take your energies away from the Astral Projection you’re trying to focus on. Considering when you’ll be attempting projection -minimizing protein intake for a few hours before that will help. Fats – Try to stick mostly to healthy fats, and you won’t have to spend too much time thinking about fats. Olives and olive oil, coconut and coconut oil (much more versatile for cooking than olive oil, as it is flavorless, and can be heated to a higher temperature without burning), avocado, nuts and seeds. There’s a lot of controversy within medicine about animal-based fats, butter – but personally I prefer them to using vegetable oils, rapeseed oil, margarine. Just exercise moderation. Fruit – Fruit may be healthy and delicious, but that doesn’t mean it isn’t high in sugars that will cause spikes in sugar levels. Have it as a treat. Carbohydrates – You probably need less than you think, and if you’re starting to put on weight then this is very likely the case. If you’re eating the recommended greens and legumes, then your carbohydrate needs are probably covered. If you also try to stick to brown carbohydrates, your body will thank you. Alcohol – personally, I love a pint of Guinness, and I’m quitting that for no-one. But, unfortunately alcohol reduces your chances of projecting, increases your chance of falling asleep, affects your will-power, and damages the chances of a strong recall of your projection. If you want to quit altogether, by all means do, but if you want an enjoyable, balanced life, don’t drink on the same day as you want to project, and preferably, not the day before. Some writers have said that alcohol is dangerous when combined with Astral Projection – I don’t believe this for a second, but it is almost certain to lead to failure. Coffee – Again, I love coffee, but because the way it affects your sleep, along with many other detrimental effects, it needs to be minimized. As withdrawal can be quite unpleasant, if you’re a heavy caffeine user, cut down slowly. If you are agitated and tense, you’re extremely unlikely to project – I don’t think I need to explain more. Bear in mind the half-life of coffee. Sugar – In my view, one of the biggest enemies of Astral Projection. This is one thing virtually all projectors agree on. Even so, you don’t have to give up sugar altogether. Life’s for living, and enjoying. But do remember how children behave when they are on a sugar rush. This should give you some idea of how well sugar is likely to help your focus (or not). Processed foods – If you can limit your intake of processed foods as much as possible, this can only help your efforts. Processed food are full of sugar, preservatives, chemicals and stuff that really isn’t helpful – plus much of the nutritional value of your food has been more-or-less destroyed. I know processed foods are convenient, and they can be tasty, but they also rob you of the experience of preparing and cooking your own food – which in itself can be a form of meditation, instead of a chore, if you approach it with the right attitude. Even here, you don’t need to 100% avoid processed foods. Although after one month of careful eating of food with high nutritional qualities, you’ll probably find that you get get very little pleasure from “bad” foods, anyway! Smoking – Besides all of the ways you already know that smoking is bad for you, it obviously affects the quality of air you breathe, and breathing is one of the central pillars of health you need to focus on for all-round health, and spiritual health in particular. In fact, once you sign-up for updates and OBE training, I’ll be explaining this (often-forgotten) piece of the puzzle. There are practitioners of the Out-of-Body Experience who do smoke – but they are a minority. Focusing on breathing is part-and-parcel of meditation, and itchy, annoying smoker’s coughs don’t help with this at all. Likewise, holding your breath doesn’t need to become more difficult than it is. Minimizing Other Toxins – Toxins and nasty chemicals aren’t just in the food and water we consume. We cook our food on harmful cookware, and then wash our dishes with more unnecessary chemicals. We clean our homes with more chemicals, and use yet more to “freshen” the smell of our home. Yet more chemicals are used to wash the clothes we wear all day, and then we wash our hair and skin with even more, before smearing different chemicals onto our skin, to moisturize, block the sun, and block our sweat glands. Chances are there are many, many, more ways that you unthinkingly add toxins to your body. Next, you fill your home with devices that pollute with light (damaging your sleep patterns in the process) and electro-magnetic fields. a) Cutting-back on some (and not all!) unnecessary and harmful products and saving yourself a lot of money in the bargain. b) This is the Biggie – It’ll stop you getting too obsessive about what you eat and drink. Once you start thinking about how many less-than-ideal toxins are around you all the time, you can’t help but realize that you need to keep things in perspective – and not let worry dominate your life. If you’re interested in finding out more about how to minimize the toxins in your home, let me know, and I can recommend some good, safer, alternatives to products you might be using. And I’ll also be helping with healthy food that complements your spiritual growth. But please, next time you read that any diet is essential for Astral Projection, please, ignore it – it’s simply not true!